The Pentagon is set in about 0.2 acre of garden, mainly grass with parking space for several cars on the gravel drive. We are fighting a continuing battle with the Wester Ross weather and the local sheep to establish a hedge, and slowly winning! A coal fire in the lounge supplements the electric storage heating. Full double glazing ensures heat is retained. So Pentagon remains cosy, while keeping the elements at bay. We have equipped the Pentagon based upon our own family experiences of staying in holiday cottages (both good and bad). So the potato peeler can be used left-handed, the tin opener works without a fight and there is an ever-increasing assortment of books, maps, games, jigsaws etc. Plus we continue to spend holidays in Pentagon ourselves and value the feedback we get from guests. Some of the other important elements are summarised below. If you are unsure about something, please ask. Unfortunately we do not have a baby cot or baby chair. Access to the internet for guests is provided through a supplied PC – see details. Range of fitted kitchen units, with an electric cooker and microwave. Fridge/freezer, dishwasher, large dining table and chairs. 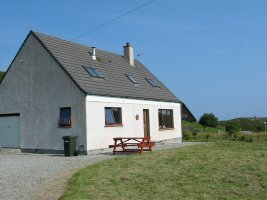 Spacious room with two windows overlooking Loch Ewe. Twin beds. Ideal ‘play’ room. Single bed, overlooking the Loch. Firemore beach a favourite for kite flying, castle building, and even swimming – with divers, razorbill, terns and even – pretty sure – an arctic skua.